"In the past, we’ve also employed a similar process with Nutcracker Ale, our winter warmer, but this year, we wanted to brew a new wet hop beer that we felt did more to showcase the aromas and flavors you can achieve by using wet hops. For this reason, we adjusted the recipe and process of Nutcracker Ale to no longer be wet hopped. Nutcracker Ale has always been dry-hopped with a combination of wet and pelletized Chinook hops. The change results in a slight loss of grassy/green character from the wet hops, but we feel that Nutcracker Ale is actually improved due to the change. The pelletized hop flavors and aromas won’t degrade nearly as fast as the wet hop character will so we’ve been able to produce a beer that will taste fresher for a longer period of time." Definitely let me know if you have any follow up questions. It depends on the beer, but our fastest beer from brew day to bottling is Unfiltered Wheat Beer at eight-ish days. Following bottling, Unfiltered Wheat Beer undergoes a secondary fermentation (bottle conditioning) that takes around five days, so all told, from brew day until it's ready to drink, you're looking at 13ish days give or take. Beers like Pale Ale or Tank 7 are in the 12-14 day range for brewing to bottling with both seeing a period of bottle conditioning as well. Our lagers, beers like KC Pils or Bob's '47, are several weeks to months between brewing and packaging to allow the beer time to cold lager in our cellars following primary fermentation. 1 - It depends and it has changed over time. As we've grown and learned a little more about planning year to year, we've made a concerted effort to stretch out the time we allow ourselves to develop new beers from our innovation program. Given that we have the opportunity to pour a wide variety of test beers in our Beer Hall and Tasting Room to get tons of feedback from Boulevard fans and first time visitors alike, we try to work on next year's beers a year (or more) out. Having said all of that, Grainstorm Black Rye IPA, brewed a few years back, saw one test batch (that our brewers absolutely nailed) before going into production while a beer like 80-Acre Hoppy Wheat Beer took around two years to finalize. We're currently in the process of finalizing our 2019 release schedule and once that's done, our brewers will begin working on beers/plans for 2020 and beyond. 2 - This may be a cop out, but I'd say it's a combination of the two. Questions like this always take me back to a brewing team meeting where we were working on Amber Ale. I thought our first go was quite tasty, but was interested in adjusting the amount of hops added to the whirlpool to give the beer a little more spicy hop flavor/aroma, but when I asked to do that, Brewmaster Steven Pauwels said, "No. Do you know why not? This beer isn't for you." What he meant is that it's important to recognize that while every beer we brew needs to be an accurate execution of intent, there are times that we, as brewers, aren't necessarily the target audience for a given beer. This isn't to say that we don't believe in the merits of the beer or think it's exactly what it's meant to be, just that every single beer doesn't need to be brewed for the palate of everyone at Boulevard. To see this in action, all you need to do is ask a group of BLVDians what they're drinking after work and you'll probably get as many answers as there are options on the Beer Hall menu. 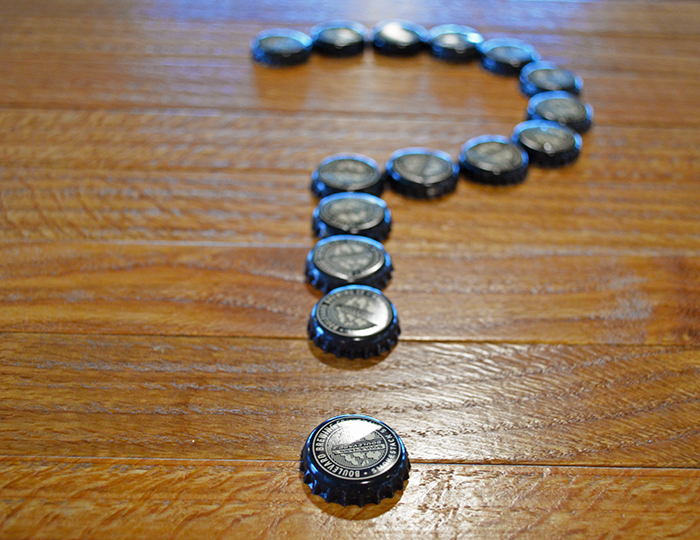 We all taste things differently and that's what makes craft beer so interesting. 1 - Right now, my favorite non-Boulevard beer is Sierra Nevada's Oktoberfest that they brewed with Weihenstephan. It's stellar, man. Picking a favorite beer is crazy hard, though, so I'll definitely have a new favorite beer next time you ask me. 2 - Hmm. I don't know that I have a favorite style of beer, but there's a type of beer that I think I tend to pick most often. For me, some of the most enjoyable beers are crisp, refreshing, lower ABV saisons/golden ales/table beers that are fermented with a fairly fruity Belgian yeast strain that also provides some peppery phenols. Major bonus points if there's some subtle acidity provided by lactobacillus and a touch of earthy funk from aging with brettanomyces. I can drink this "type" of beer all day long. 3 - You know, it's weird, but I've never homebrewed. The first batch of beer I ever made was when I started brewing professionally at the now-closed 75th Street Brewery in June of 2006. The smallest amount of beer I've brewed is 217 gallons! I feel like homebrewing is something I'll get into once I retire, but right now, with my family and my busy travel and event schedule, I just don't have the time. The other factor is that I'd want to buy super fancy equipment similar to what we use at Boulevard and that's just not possible right now. 4 - Join a homebrew club right away, even before you buy any equipment or brew your first batch. Many experienced homebrewers are super willing to allow interested folks to come brew with them to see if they want to pick up the hobby up after seeing all the work that goes into it. Being a club member also offers an instant support system for all of your questions, troubleshooting and educational needs. I'd say it's actually the opposite. I'm reminded of what Steven Pauwels told me after returning from a trip back home to Belgium three or so years ago. He said that when he'd go back, he'd always take the opportunity to visit as many brewing friends to see what they were working on, but on this particular trip all of his buddies wanted to know what we were doing in the American craft brewing scene. We've gone from being the laughing stock of the international brewing scene to being the source of inspiration for brewers around the world. It's an amazing time to be a beer drinker in the US!